On the trendy Via de’ Tornabuoni, nestled in the courtyard of the luxe Palazzo Tornabuoni, is a new restaurant, Obikà, the latest location in a chain of mozzarella bars that has its birthplace in Rome, and now has siblings in London, New York, Kuwait City,Tokyo, Turin and Milan. Obikà has the look of a stylish bar where one can stop in for a snack and a glass of wine. But it is more. 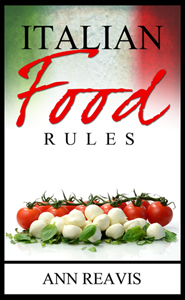 You can get a full meal – antipasto, primo, secondo and dolce – or you can simply have a hand-pinched ball of the freshest mozzarella di bufala with a side of prosciutto or salame or tomatoes and basil, paired with a glass of Tuscan wine. The minimalism of the counter at one end with its clear containers, which hold balls of the mozzarella and colorful vegetables, and even the brushstrokes of its logo suggest a Japanese, more than Mediterranean, sushi bar, not for fish, but for the freshest of cheeses. At the other end of the vast room is a cocktail bar of identical design, serving a full range of drinks. 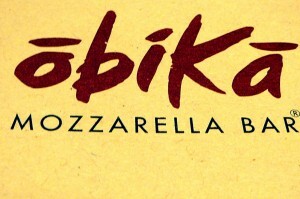 Obikà focuses on the most prized mozzarella in Italy, small and large balls of mozzarella di bufala, made from water buffalo milk. For some, the smoked affumicata is the best choice, especially paired with a Sicilian eggplant caponata. 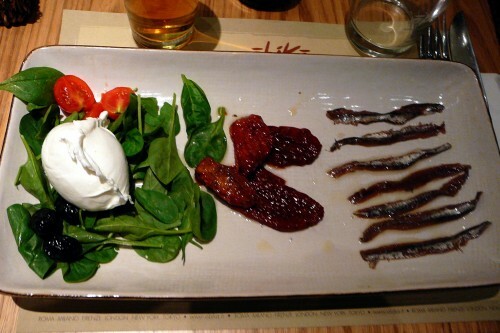 For others the favorite styling is stracciatella di burrata. Burrata starts out much like mozzarella and many other cheeses, with rennet used to curdle the warm milk. But then, unlike other cheeses, fresh mozzarella curds are plunged into hot whey or lightly salted water, kneaded and pulled to develop stretchy strings, then shaped in whatever form is desired. 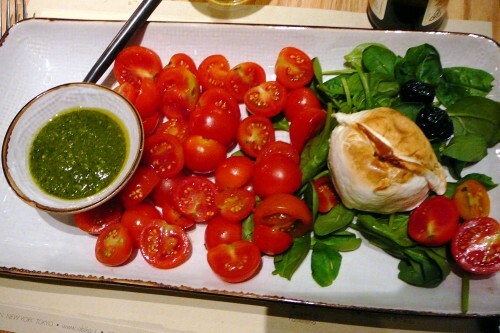 When making burrata, the still-hot cheese is formed into a pouch, which is then filled with scraps of leftover mozzarella and topped off with fresh cream before closing. Obikà serves a small glass bowl with only the buttery “scraps” swimming in cream. Obikà’s mozzarella is served with accompaniments such as Sardinian bottarga, mortadella with pistachios, Tuscan porchetta, Ligurian pesto and seasonal fresh figs. Large salads, tasty pastas, desserts, coffees and a large selection of Italian wines from small Italian producers are also available. Each evening the large raised communal table is decked with small plates of the freshest snacks, salty and sweet, some with mozzarella and some without. For 9 euro, guests are invited to eat all that they wish, accompanied by a cocktail or glass of wine to drink. The only drawback to Florence’s Obikà is the service. The staff is either uncaring or poorly trained. Dropped and sloshed drinks, delivery of the wrong order, ignored requests for the bill, staff surfing the music sound track or congregating at the bar to chat, and a bartender who loves the crash the empties into the trash, may be part of any meal. (See 100 Things Restaurant Staffers Should Never Do, Part 1 and Part 2) Also, there was a disconcerting architectural design flaw (perhaps, by now, it has been solved) that resulted in all of the collected dirty dishes being periodically wheeled through the tables to a washing facility located somewhere not connected to the restaurant. Neither this nor the service failings should be sufficient to discourage the visitor from enjoying the impressive décor or the superlative cuisine. Hmm… I have been meaning to test this out when I have a guest in town or something (i heard it’s pricey), but your comments about service and dirty dishes have got me thinking that might not be a good idea! Don’t let the service discourage you. Just don’t be surprised by it. 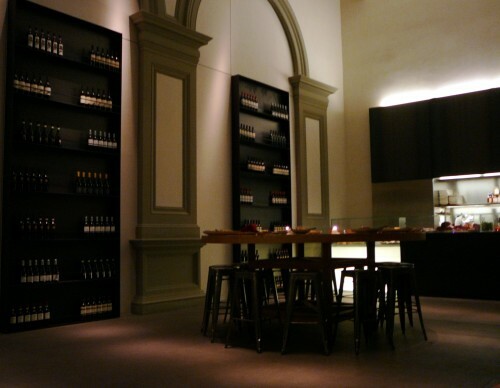 As I said – it’s a great space and fabulous food and the price is very reasonable (9 to 20 euro per person).